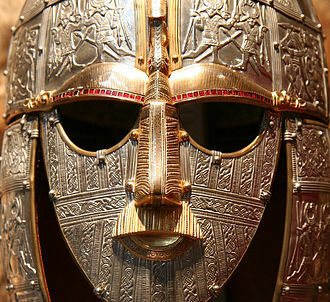 The Thingmen (also known as Þingalið (pronounced [ˈθiŋalið], literally "assembly retinue") was a standing army in the service of the Kings of England during the period 1013-51, financed by direct taxation which had its origins in the tribute known as Danegeld. It consisted mostly of men of Scandinavian descent and it had an initial strength of 3,000 housecarls and a fleet of 40 ships, which was subsequently reduced. Its last remnant was disbanded by Edward the Confessor in 1051. 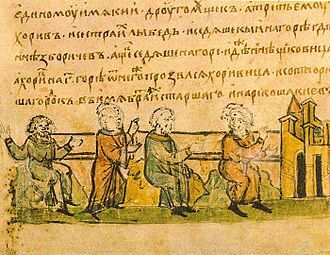 In the 11th century, three courts outside Scandinavia were particularly prominent in recruiting Scandinavian troops: Novgorod-Kiev (Kievan Rus') c. 980-1060, Constantinople (the Varangian Guard) 988-1204, and England 1018-1051. Scandinavia was however also a recruiting area for attacks against England and this is why a defence needed to be organized by the Danish king Cnut the Great. 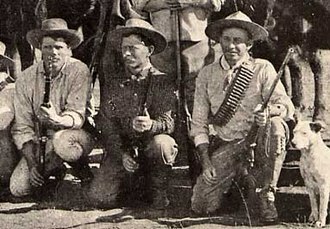 The Thingmen attracted Swedish mercenaries, and probably some Norwegian as well. In 1012 King Æthelred the Unready of England ended several years of devastating attacks by a Danish army led by Thorkell the Tall by making a huge payment of Danegeld. Most of the raiders dispersed, but Thorkell himself entered English service with 45 ships and their crews. This force, based at Greenwich, was paid with money collected through the tax system established to raise Danegeld. They remained loyal to Æthelred during the Danish invasion led by King Swein Forkbeard in 1013, which eventually drove Æthelred to flee the country. When Æthelred was restored to power in England in 1014, after the death of Swein, he retained or regained the services of Thorkell and his men, who continued to receive large sums of money. However, in 1015 Thorkell, accompanied by 9 ships, joined the fresh invasion of England being prepared by Swein's son Cnut. 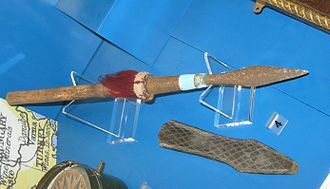 According to a later saga tradition this defection was due to the massacre of a separate force of Danish troops brought to England by Swein and commanded by Thorkell's brother Hemming. The chronicle of Florence of Worcester claims that the 40 ships which deserted Æthelred to join Cnut's invasion force after its arrival in England, under the leadership of Ealdorman Eadric Streona of Mercia, were manned by Danish crews. 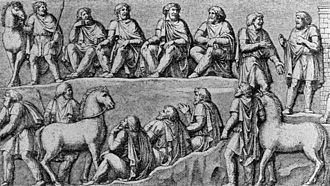 If so, these may have been the residue of Thorkell's former followers who had remained in Æthelred's service when their leader left. While the upheavals of 1015 thus ended, this experiment of keeping a standing, tax-funded force of Scandinavian mercenaries in England set a precedent which was followed by Cnut after his conquest of England, completed in 1016. 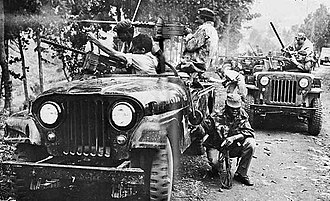 Most of his invasion army was dismissed and returned home, but 40 ships and their crews were retained in the king's service. The 12th century Danish chronicler Sven Aggesen told a story of how these men were selected. 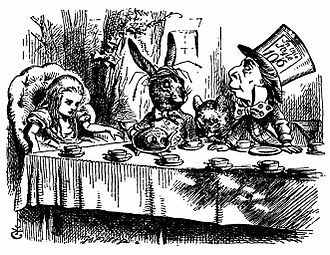 According to this tale, Cnut had attracted a large number of men and many had not had the opportunity to distinguish themselves in battle. Consequently, he decided to select those that were the most prominent in origin or wealth in order to form a royal bodyguard. Therefore, he had a herald proclaim that only those who had especially valuable weapons would have the distinction of counting themselves among the king's housecarls. After this proclamation, those who were less affluent retired while the successful warriors, who had gathered considerable amounts of spoils of war, used their wealth to embellish their weaponry with gold and silver. He selected 3,000 men who were thenceforth the Thingmen. The Thingmen had their own laws, which enforced quality within the unit, even going so far as to make the men equal to the king. 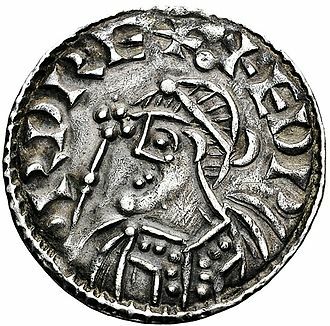 Under Cnut, the system of direct taxation in silver, based on an assessment of land value, which had been used as an occasional expedient by Æthelred to raise individual lump sums of Danegeld, became a regular annual form of levy to support this standing force, a payment now known as heregeld (army-tax). Each man was paid 8 marks of silver, 12 marks for the helmsman who commanded each ship. As the new Danish dynasty consolidated its position, the number of troops employed was considerably diminished. By the reign of Cnut's son Harold Harefoot, who came to power in 1035, only 16 ships were kept in service. Harold's half-brother Harthacnut, who succeeded him in 1040 and arrived with a fleet from Denmark, dramatically increased the tax burden to pay for 60 or 62 ships in the first year of his rule in England, but reduced this force to 32 ships in 1041. This tax increase provoked violent unrest. Under Edward the Confessor, who came to the throne in 1042, the standing force was further reduced and by 1050 he was employing only 14 ships. In that year 9 of these were dismissed and in 1051 the remaining force was disbanded and the heregeld was abolished. Several of its members are commemorated on runestones, such as the Viking Runestones and the England Runestones. One example is the Komstad Runestone which was raised in memory of the marshall Vrái, who had served in England with his brother Gunni, something that Vrái reported himself on the Sävsjö Runestone. Other examples are the Kålsta Runestone, where two sons report that their father was a member of the Assembly Retinue, and the Gåsinge Runestone which was raised in memory of a warrior who served Canute the Great. ^ Pritsak 1981:410 refers here to the runestone U 617. Look up thingmen in Wiktionary, the free dictionary. 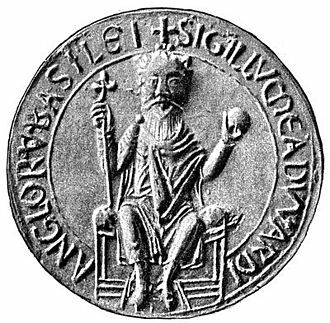 Sweyn Forkbeard was king of Denmark and parts of Norway. His name appears as Swegen in the Anglo-Saxon Chronicle and he was the son of King Harald Bluetooth of Denmark, and the father of Cnut the Great. In the mid-980s, Sweyn revolted against his father and seized the throne, Harald was driven into exile and died shortly afterwards in November 986 or 987. In 1000, with the allegiance of Trondejarl, Eric of Lade, in 1013, shortly before his death, he became the first Danish king of England after a long effort. Many details about Sweyns life are contested, Adam of Bremen identifies his mother as Gunhild while the Dictionary of National Biography states that his mothers name is unknown. The Danish encyclopedia Den Store Danske on the other hand identifies her as Tove from the Western Wendland, many negative accounts build on Adam of Bremens writings, Adam is said to have watched Sweyn and Scandinavia in general with an unsympathetic and intolerant eye, according to some scholars. Adam accused Forkbeard of being a pagan who persecuted Christians, betrayed his father and expelled German bishops from Scania. According to Adam, Sweyn was sent into exile by his fathers German friends and deposed in favour of king Eric the Victorious of Sweden, whom Adam wrote ruled Denmark until his death in 994 or 995. Historians generally have problems with Adams claims, such as that Sweyn was driven into exile in Scotland for a period as long as fourteen years. As many scholars point out, he built churches in Denmark throughout this period, such as Lund and Roskilde, Sweyn was believed to have had a personal interest in the atrocities, with his sister Gunhilde and her husband possibly amongst the victims. Sweyn campaigned in Wessex and East Anglia in 1003–1004, but a famine forced him to return to Denmark in 1005, further raids took place in 1006–1007, and in 1009–1012 Thorkell the Tall led a Viking invasion into England. Simon Keynes regards it as uncertain whether Sweyn supported these invasions, some scholars have argued that Sweyns participation may have been prompted by his state of impoverishment after having been forced to pay a hefty ransom. 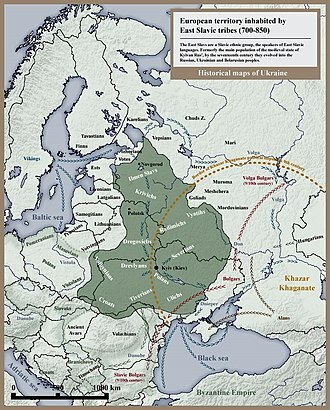 Druzhina, Drużyna or Družyna in the medieval history of Poland and Kievan Rus was a retinue in service of a chieftain, called knyaz. The name is derived from the Slavic word drug with the meaning of companion, compare it to druhti of old Germanic cultures. 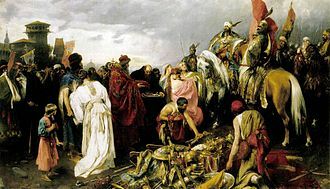 In early Rus a druzhina helped the prince administer his principality, the first members of a druzhina in Rus Khaganate were the Varangians, whose princes established control there in the 9th century. Soon members of the local Slavic aristocracy as well as adventurers of a variety of other nationalities became druzhinniki, the druzhina organization varied with time and survived in one form or another until the 16th century. The druzhina was composed of two groups, the members, known as boyars, and the junior members. 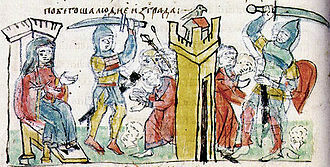 The boyars were the prince’s closest advisers who performed higher state functions, the junior members constituted the prince’s personal bodyguard and were common soldiers. Members were dependent upon their prince for financial support, but they served the prince freely and had the right to leave him and join the druzhina of another prince. Taxation in medieval England was the system of raising money for royal and governmental expenses. 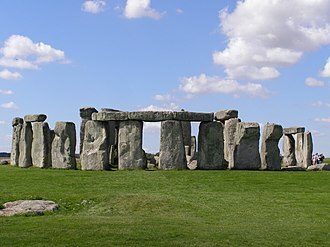 During the Anglo-Saxon period, the forms of taxation were land taxes. 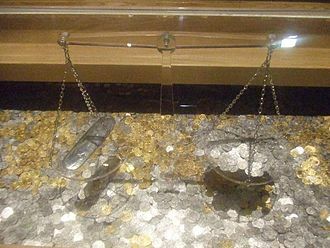 The most important tax of the late Anglo-Saxon period was the geld, after the Norman Conquest of England in 1066, the geld continued to be collected until 1162, but it was eventually replaced with taxes on personal property and income. Britannia, the southern and central part of the island of Great Britain, was a province of the Roman Empire until the Roman departure from Britain in around 400 AD. 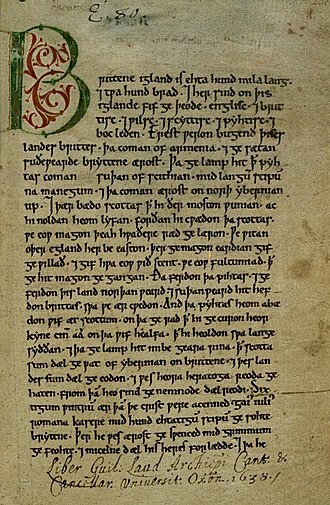 No other forms of taxes are mentioned in Æthelberhts law code, other mentions of taxes are contained in the law code of King Ine of Wessex. 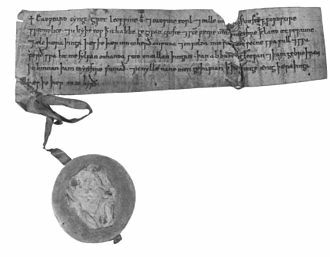 A document from the 7th or 8th century, the Tribal Hidage, charters from the time of King Offa of Mercia show that tolls were collected on trade, and it was during Offas reign that coinage in silver pennies was first introduced into Anglo-Saxon England. Coinage became a right, and was probably introduced to make payment of taxes easier. In early Anglo-Saxon England the hide was used as the basis for assessing the amount of rent due from an area. Initially the size of the hide varied according to value and resources of the land itself, over time the hide became the unit on what all public obligation was assessed. 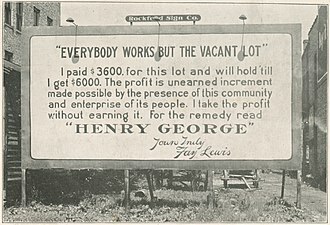 Tenants had an obligation, based on their landholding, they had to provide manpower for the so-called common burdens of military service, fortress work. 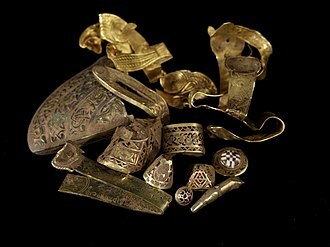 With increasing problems from raiding Vikings, the Anglo-Saxon leaders raised taxes, the tax was known as Danegeld and was used to pay the raiders off rather than fight. In the 9th century Alfred the Great confronted the Viking problem, after his victory over them at the Battle of Edington he set about building a system of fortified towns or forts, known as burhs. He updated the traditional fyrd to provide a standing army, to fund all of these changes Alfred required a new system of tax and conscription that is contained in a document, now known as the Burghal Hidage. Harvard University Press is a publishing house established on January 13,1913, as a division of Harvard University, and focused on academic publishing. 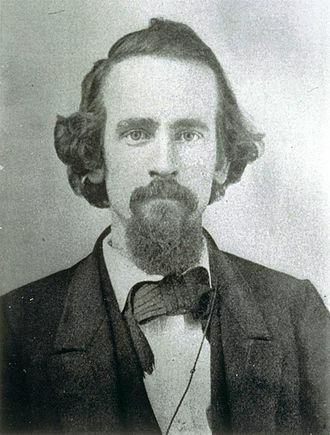 In 2005, it published 220 new titles and it is a member of the Association of American University Presses. Its current director is William P. Sisler and the editor-in-chief is Susan Wallace Boehmer, the press maintains offices in Cambridge, near Harvard Square, in New York City, and in London, England. The Display Room in Harvard Square, dedicated to selling HUP publications, HUP owns the Belknap Press imprint, which it inaugurated in May 1954 with the publication of the Harvard Guide to American History. The John Harvard Library book series is published under the Belknap imprint, Harvard University Press distributes the Loeb Classical Library and is the publisher of the I Tatti Renaissance Library, the Dumbarton Oaks Medieval Library, and the Murty Classical Library of India. It is distinct from Harvard Business Press, which is part of Harvard Business Publishing, Harvard University Press books Hall, Max. Greenwich is an early-established district of todays London, centred 5.5 miles east south-east of Charing Cross. 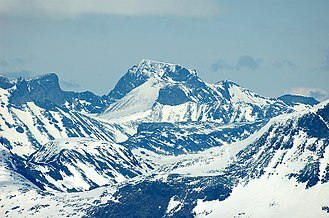 The town lends its name to the Royal Borough of Greenwich, Greenwich is generally described as being part of South-east London and sometimes as being part of East London. Greenwich is notable for its history and for giving its name to the Greenwich Meridian. The town became the site of a palace, the Palace of Placentia from the 15th century. The palace fell into disrepair during the English Civil War and was rebuilt as the Royal Naval Hospital for Sailors by Sir Christopher Wren and his assistant Nicholas Hawksmoor. These buildings became the Royal Naval College in 1873, and they remained an establishment for military education until 1998 when they passed into the hands of the Greenwich Foundation. The historic rooms within these buildings remain open to the public, other buildings are used by University of Greenwich and Trinity Laban Conservatoire of Music and Dance. The town became a resort in the 18th century and many grand houses were built there, such as Vanbrugh Castle established on Maze Hill. From the Georgian period estates of houses were constructed above the town centre, Greenwich formed part of Kent until 1889 when the County of London was created. The place-name Greenwich is first attested in a Saxon charter of 918 and it is recorded as Grenewic in 964, and as Grenawic in the Anglo-Saxon Chronicle for 1013. It is Grenviz in the Domesday Book of 1086, and Grenewych in the Taxatio Ecclesiastica of 1291, the name means green wic or settlement. An article in The Times of 13 October 1967 stated, East Greenwich, gateway to the Blackwall Tunnel, remains solidly working class, the manpower for one eighth of Londons heavy industry. West Greenwich is a hybrid, the spirit of Nelson, the Cutty Sark, the Maritime Museum, an industrial waterfront and a number of elegant houses, ripe for development. Royal charters granted to English colonists in North America, often used the name of the manor of East Greenwich for describing the tenure as that of free socage, New England charters provided that the grantees should hold their lands as of his Majesty’s manor of East Greenwich. 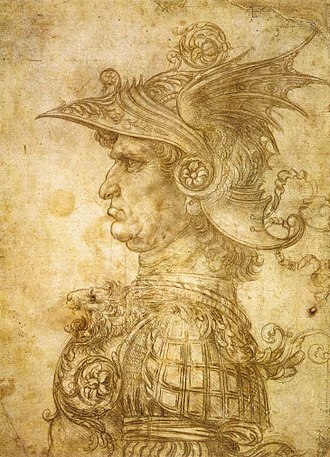 Leonardo da Vinci's Profilo di capitano antico, also known as il Condottiero, 1480. Condottiero meant "leader of mercenaries" in Italy during the Late Middle Ages and the Renaissance. 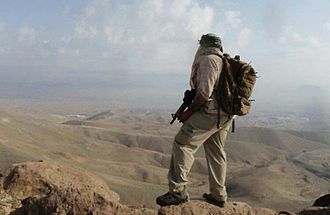 Private Military Contractor in Badakhshan Province, Afghanistan, 2006. 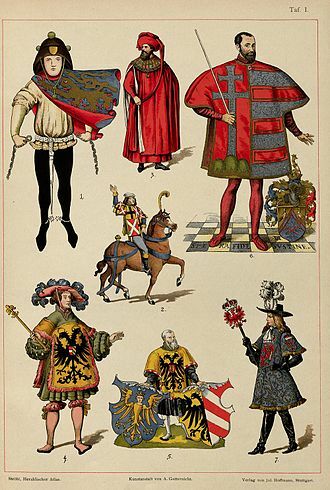 Pictures of heralds from the 14th-17th Century, from H. Ströhl's Heraldischer Atlas. 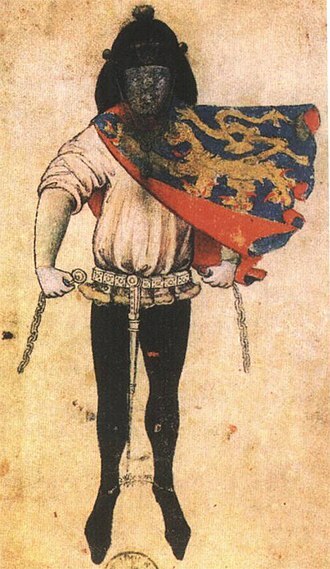 Herald Gelre of the Duke of Gueldres (around 1380). Bavarian herald Joerg Rugenn wearing a tabard of the Coat of arms of Bavaria, around 1510. 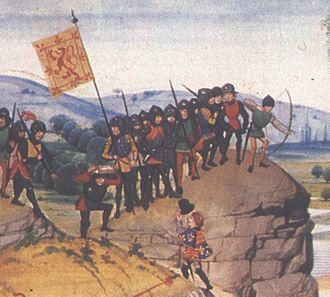 A 14th-century illustration showing an English herald approaching a troop of Scottish soldiers - an incident of the Anglo-Scottish Wars. The Stenkvista runestone in Södermanland, Sweden, shows Thor's lightning hammer instead of a cross. Only two such runestones are known. The Mask Stone (DR 66) found in Aarhus, Denmark commemorates a battle between two kings and features a stylized depiction of a mask. Runestone U 349 in a 17th-century drawing. Runestone U 363 in a 17th-century drawing. The rune stone U 504. 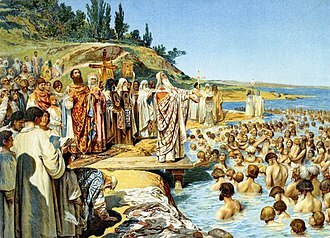 The Baptism of Kievans, a painting by Klavdiy Lebedev. 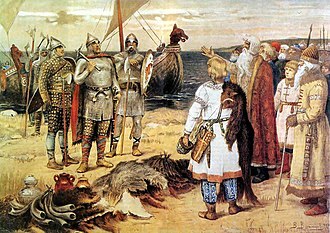 The Invitation of the Varangians by Viktor Vasnetsov: Rurik and his brothers Sineus and Truvor arrive at the lands of the Ilmen Slavs. Harthacnut meeting King Magnus at the Göta älv. Illustration by Halfdan Egedius. Side C of U 539. Runestone U 330, one of the Snottsta and Vreta Runestones in Uppland, Sweden, mentions Assurr/Ôzurr, the housecarl of the owner of the Snottsta estate in whose memory the stone was raised. 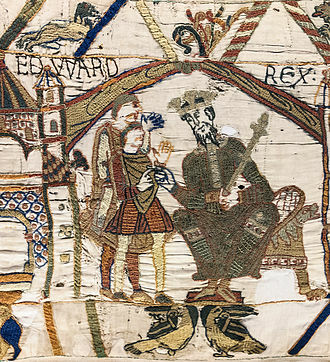 This part of the Bayeux tapestry probably shows a fight between a Norman knight (right) and an English housecarl, wielding a Dane axe with two hands. 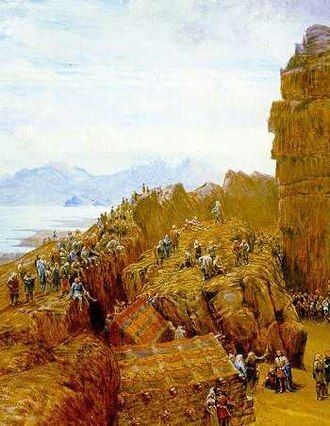 The Icelandic Althing in session, as imagined in the 1890s by British artist W. G. Collingwood. Þorgnýr the Lawspeaker showing the power of his office to the King of Sweden at Gamla Uppsala, 1018. The lawspeaker forced King Olof Skötkonung not only to accept peace with his enemy, King Olaf the Stout of Norway, but also to give his daughter to him in marriage. Illustration by C. Krogh. 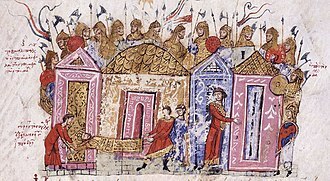 Sweyn (Suanus rex) invading England in 1013 (detail of a 13th-century miniature). Cambridge University Library. The runestone U 617 near the church of Bro. The runestone Sm 76 at the inn of Komstad. A page from Hemming's Cartulary, an 11th-century manuscript. The initial page of Corpus Christi College Cambridge MS 173, the Peterborough Chronicle, which contains the oldest surviving copy of Ine's laws. Grand Prince Vladimir Monomakh of the Rurikid dynasty resting with his druzhina after a hunt, by Viktor Vasnetsov.